Our friends at Bath Drama are hosting their very own week of workshops to celebrate all things drama. Join them at The Bath Drama Hut, Vane Street: Monday 10th July to Friday 14th July for five evenings of fun! Each evening starts at 19.30 and is open to everyone. Monday - Thursday, our workshops are £3 each or £10 for all four! Friday brings us all together for a BBQ, Bingo and a raffle! This is £7 for adults and £3.50 for under 15s. All evenings are pay on the door. Gemma De Carteret hosts an evening that explores mental health through drama. Looking to create an original script, she'll bring ideas, characters and plots and then you'll improvise the scenes. This evening is suitable for everyone, whether you've had experience with mental health or not, whether you're an actor, a writer or a director, come together and help Gemma create something new. Ever wanted to direct but unsure where to begin? Love a play but unsure how you'd stage it? Come along to this directing workshop and see what you could learn. Gill Morrell is an experienced and ambitious director who has staged many successful productions for Bath Drama and Shakespeare Live. No experience necessary, just an open mind and a willingness to learn! Leave your inhibitions at the door! Cara Aldous and Kirsty Woods are hosting an evening of drama games and improv. This will explore old favourites and brand new games. Give you a chance to meet new and like minded people and have a lot of fun! Gromalot is a style of language used in satirical theatre, a gibberish with macaronic and onomatopoeic elements, used in association with mime and mimicry. Join David Wood as he leads us through this hilarious drama technique! Join us on Friday for a celebration of the week, the month and the year! Our famous summer BBQ will be teamed with an evening of Bingo and a raffle with some great prizes to be won, kindly donated by members and such lovely companies as The Roman Baths, Sally Lunn's Buns, Boston Tea Party, The Bath Massage Company and The Royal MacDonald Hotel. Friends and family welcome. Off to find the treasure chest - a pirate's life for me! 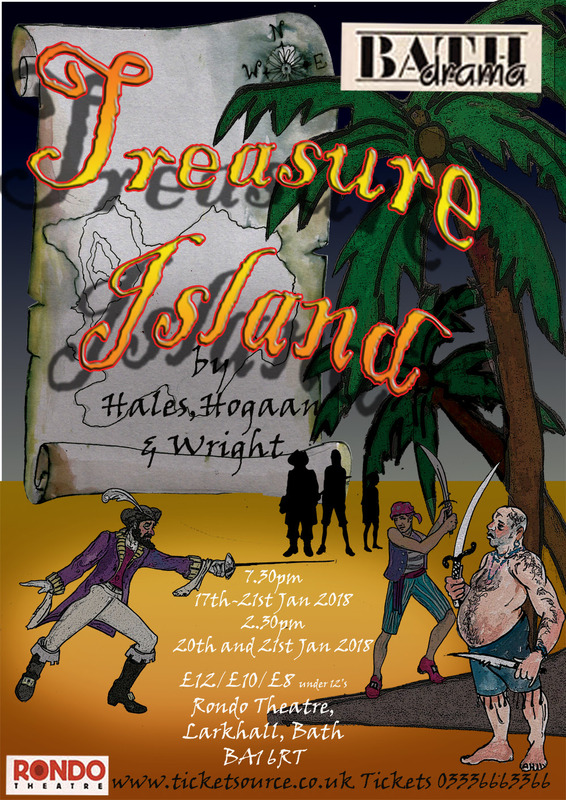 Bath Drama's winter show will be Treasure Island! The famous tale as you've never seen it before. 'RL Stevenson's rollicking adventure yarn featuring Jim Hawkins, Long John Silver, Blind Pew, Ben Gunn et al., brought to vivid life by the team of Claire Wright, Richard Hales, & Mike Hogan. Young Jim and his Mum Harriet find Captain Flint's map and aided by Squire Trelawney and his daughter Polly set sail in Captain Smollett's ship to retrieve the treasure. But he is pursued by Flint's vindictive spirit, and assorted cut-throats, including the infamous Long John silver. Jim Hawkins - Principal boy, son of the Dame. In love with Polly. A bright, honest character. Dame Harriet Hawkins - Dame. Owns the Admiral Benbow Inn. Terrible flirt, very over-the-top. Polly Trelawney - A sweet, good-natured and intelligent girl. Squire Trelawney - Good, rich, landed gentry. Bit of a 'nice but dim' character. Captain Flint - A very melodramatic and evil character. Long John Silver - Captain of the Pirates. A significant and pivotal role. Blind Pew - Second in command, blind, sarcastic and clever. Billy Bones - An old sea dog, dramatic. Ben Gunn - A pirate who has been marooned on the island for years, talks to the animals. There is also a large selection of 'chorus' members, made up of inn regulars, pirates and animals. There is plenty of opportunity to double up in parts and plenty of lines for all involved. I've not specified ages or sexes, as in true pantomime style, the parts can be mixed up and very non-traditional. There are some fantastic musical numbers, some great costumes and some really great lines. The show will be great fun for all involved. Rehearsals will start mid-October and will be Wednesday and Sunday evenings until January. Show dates are the 17th - 21st January 2018.